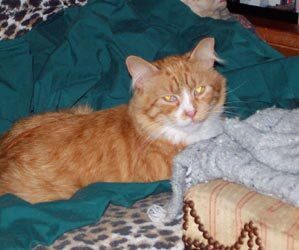 Ares is the sweetest, friendliest, funniest untamed feral with us. By friendly, I mean that he's very sociable, affectionate & loving, but only to animals, not people. He seems to want to befriend people too, but is just not ready to make that leap of faith. Ares got his name from his demeanor when he was first rescued. He was a big adult tomcat & was very frightened, & hence very ferocious & intimidating. He had a constant glower of attitude & distrust in his eyes. It was clear he would never be tamed so, after getting neutered & checked at the vet, he left the crate & joined the CR!FR tribe. Ares was very timid & would hide when anyone entered the main feral area. After some time, he'd let himself be seen, peering out from his hiding place to see what was going on. Later, he would resist the flight impulse & hold his ground, looking frightened but brave enough stay put. 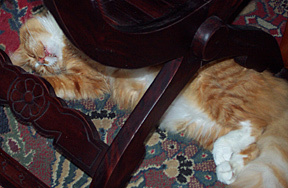 Eventually, he felt relaxed enough to remain in his nap spot & not allow the intrusion to disturb his sleep. Nowadays, Ares is a totally different cat. 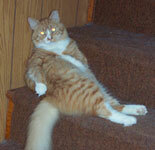 He is a great presence upstairs with the tame & sociable cats. He's always rushing over to be a part of any gathering or to trot into an opened door. He's very sweet to the other cats, who he greets with enthusiastic affection. He has a particular fondness for Max, our adopted American Eskimo dog. He hurries up to Max & cuddles against him, with his tail up & back arched, as if they were a long-separated couple reunited. Ares is still too timid for people at the moment. But I sometimes wake up & find him sleeping on the bed, sometimes very close to me (he has the cutest habit of curling up his toes when sleeping). It's a good bet that eventually he'll allow himself to be petted & will realize what he's been missing - that it's nice to be loved as well as show love!